The British countryside is your seasonal oyster, and a king of the open-world racing genre. Playground Games has cemented the open-world formula of car racing culture, so how much farther can Forza Horizon 4 go? It’s usually about destinations and abundant wealth of content, with minor emphasis on objective it’s always been about enjoying the scenery and being able to hop behind the wheel of the fastest or most unconventional ride of your dreams. The fourth time is no different with an absurd amount of driving stuff to do and nobody to tell you how or when to do it—this is pure automotive nirvana once again. The Australian outback of Horizon 3 is traded for the quaint splendor of Great Britain, a locale change that isn’t as outwardly radical and seemingly too amicable to involve much of anything to do with high speeds. It also doesn’t seem to be as vast but ripping through the farmland isn’t as docile as things appears; it doesn’t take long to get sucked in when you realize that you can become one with the environment by any means necessary. taking shortcuts between fields and backyards is an understatement, now that smashing through fences and cobblestone walls in destructive fashion is now an accepted means of driving. Launching off of anything from ramps and chapels is expected, but there’s very little that will slow you down here. It’s damn-near hilarious to carve your own path. But as I said, the enormity of down-under is substituted by the introduction of the four seasons themselves. The experience isn’t as deep as I’d like but the immediate effects are mildly dynamic in a mostly satisfying way—and no, it’s not just certain areas affected by summer or winter, the whole landscape transforms when a season changes. This effectively takes the driver out of their comfort zones but pays off in keeping activities and races fresh. For instance, summer is a quintessential paradise for rev-topping speeders on dry pavement, spring and fall require finesse as rainy weather or road debris often turns into test of handling skill, while the winter is a wonderland primarily for drifting and calculated driving over ice and obstructing snowfall. It is nicely implemented on a basic level and encourages you to return the garage and ride in something you never would’ve considered beforehand. For those who loathe being forced to endure slick winter roads it’s a double-edged approach. The seasons do rotate on a weekly schedule and you’ll get a quick taste of everything within the first six hours, but you do get the freedom to change the forecast for most race events. This level of flexibility is par for the course on any Forza Horizon title and is fairly accommodating if you’re not exactly masterful at winning 1st place, you still get credits and can happily be on your way if you simple want to move on to whatever’s next on the bucket list. It’s nearly impossible not to progress in any meaningful way with this game. You’ve got plenty to do considering there are over 25 campaign types that branch off into track, street, drifting, and cross country categories—and this is further varied by taking side jobs as stunt driver and exploring for barn find rarities. 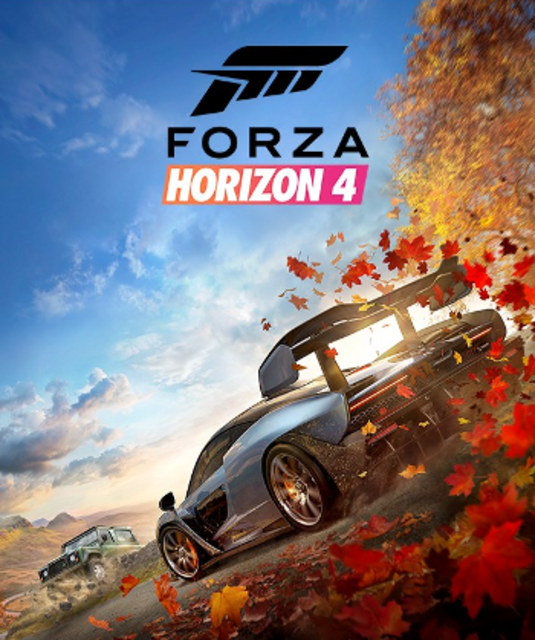 That said, the only structure of Horizon 4 is to keep racing to earn credits, and become the biggest influencer to whatever social platform this game is trying to parody. Horizon 3 and The Crew 2 had you doing something similar, but here the notion is heavily stripped down for the hustle of your avatar getting as many people to follow you. Sure it’s vapid as hell but it’s self-aware in knowing that it’s a thin pretense for driving a car really fast. It’s not handled with any seriousness so I don’t find the notion patronizing, but if you do want to deck out your onscreen character with clothing, victory poses, and other pieces of swag then have at it. If you’re about playing a game to completion then you’re in it for the long haul, fortunately for everybody else, multiplayer options help reduce the inevitable single-player monotony. We’ve seen this in the previous game and the opportunity to dive into something with other players maintains some fun spontaneity during and outside of the main campaign. Create or join teams, make progress in your open-world journey with up to 72 players, or contribute in an hourly Forzathon event that encourages short but entertaining group challenges that afford a change to acquire rare cars and mods that are inaccessible otherwise. The general aspects are carried over but is much less frustrating as other players can no longer collide with each other or NPCs, eliminating a lot of the unintentional woes or stray troll to derail the fun. Should you play this on the console or PC? Well, the good news is that Horizon 4 is awesome no matter which platform you’re playing on. Granted, if you have the means of hardware then the experience is going to look cleaner on a gaming PC. Take a NVIDIA GTX 1080 or RTX 2080 and you’re gonna have a good time with ‘high’ or ‘ultra’ presets enabled. But since this is an Xbox One title, the graphics are still beautiful to behold and retains a fluid 60fps count. You’ll only get HDR capability with an One S but the additional 4K rendering on the One X is merely silver icing on an already delectable cake. Either way, you’ll be happy with how this game looks. The biggest takeaway of Forza Horizon 4 is a continuation of motoring excess like its predecessors. It does take a little while for newcomers to get acquainted as the British seasons roll on, but it’s hard to get hung up because you’ll be distracted by how much stuff there is to do. It doesn’t reinvent the series as they probably intended but it really didn’t have to in terms of constraints, and is impressive on how it doesn’t take itself too seriously nor compromise its core appeal. There really isn’t much to say other than if you already love the series, then this will most likely be your new favorite light arcade-style racing game to date.